The first time I taught this unit, boomwhackers, or whackatubes, as they seemed to be called now, had barely made it into the music catalogues. I used the cardboard tubes from inside wrapping paper, and played them by tapping the open end with drinks coasters. They did not last for many lessons with the particular crowd of children I was teaching at that time, I have to say. The tubes, I mean. The coasters are still going strong, and the children are no longer at any school, except maybe as teachers. 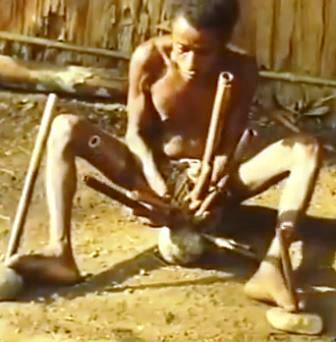 I love the sound – and I amazed at his skill. The class listened to the clip supplied in the Music Express year 6 book. It took several attempts – at first they were keen to jiggle and fidget about, and although they were clearly enjoying the music, they weren’t actually “listening” to it. So I let them “express themselves” and then we listened again, sitting still and not giggling. We picked out features of the music – cyclic patterns, obviously, but also changes in texture, rhythm and pitch. Then I set them the task of re-creating the effect, in groups of 4, using a boomwhackers (one each). It was the most enjoyable lesson I have taught all term – well, to be truthful, it was the first lesson of term. My role seemed to reduce to going round the groups and asking if they were organised and knew what they were doing “”yes, yes, we’re all sorted”). I got the feeling that my questioning was seen as a bit of an irritating interruption to what they were doing. After about ten minutes I could stand the noise no more, so we listened to each group in turn. Amazing! They had all picked up on the requirement to create cyclic patterns involving pitch, texture and rhythm. I encouraged them to comment on each other’s work, and to pick up ideas from what they heard. There was still a good chunk of lesson to go, so I gave them another block of time to develop and improve their work. This time I knew my place, and just stood and watched the scene and sounds of activity all around. When we listened to their work again, they had all added features – dynamics, additional rhythmic patterns, changes to texture. I went home from that lesson very happy indeed! This entry was posted in Composition, Lessons that have happened, The organised teacher and tagged boomwhackers, cyclic patterns, Solomon Islands, stamping tubes. Bookmark the permalink.